When Lincoln was assassinated in 1865, he became the final casualty of the Civil War. In the aftermath, the City of Chicago renamed a North Side cemetery to memorialize him. Today, the area of Lincoln Park is rich with lore of the Illinois Son, and the old cemetery has grown to include the Lincoln Park Zoo, several water features, historical monuments, and natural areas. The larger area, also called Lincoln Park, includes the famous Elks Memorial, large residential neighborhoods, hotels, and shopping. As a studio project, we were asked to design a small “aedicule”, or frame for a reduced-scale replica of Daniel Chester French’s seated Lincoln (The Lincoln Memorial, Washington D.C. by Henry Bacon). This small frame would attach to the south face of the 1893 Italianate Matthew Laflin Memorial Building, by Patton & Fisher, which currently functions as the Lincoln Park Zoo administrative offices (although we were asked to imagine the building as a fictitious academic library). Attached are some pictures from our site visit and my aedicule proposal. The Matthew Laflin Memorial Building, by Patton & Fisher, ca. 1893 (AKA known as the Chicago Academy of Sciences). Lincoln Park, Chicago. Upper south wall of the Matthew Laflin Memorial Building. South wall of the Matthew Laflin Memorial (Chicago Academy of Sciences), where Lincoln’s aedicule would be installed. The goal was to at once evoke reverberations of Bacon’s iconic Lincoln Memorial and Chicago’s 19th-century appetite for Greek Revival architecture. 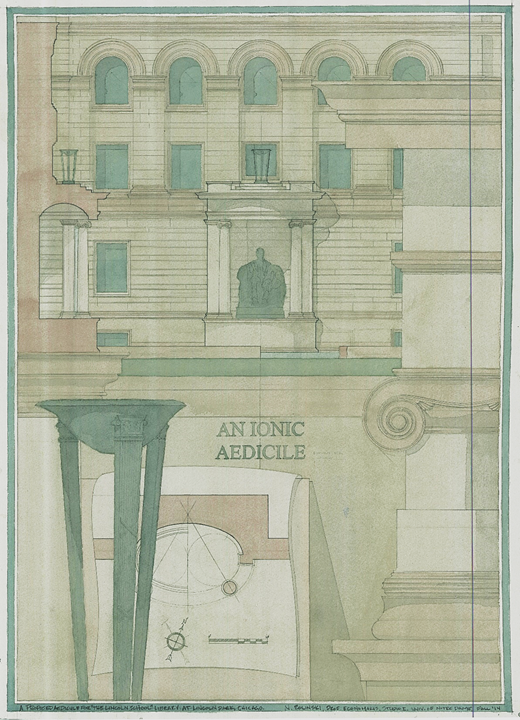 The structure protrudes from the Matthew Laflin Memorial Building as a half-ellipse in plan, and is Ionic in Order. The President seated in the elliptical plan is meant to recall a whistle stop tour, while a surrounding elliptical water feature allows for classroom use, where children can learn of Lincoln, and cast a penny into the water (eventually leading to hundreds of tiny Lincoln heads and Memorials shining back at the aedicule). Above the entablature, an adapted reference to the Monument of Thrasyllus under the Acropolis is used to mimic the general shape of Bacon’s blocking course. The blocking course segments, as well as the Ionic Orders (columns and antae) are segregated to the sides, perhaps to speak of a split nation. As the eye wanders upward, a central Greek tripod represents an eventual victory, while Lincoln himself remains at task, unifying the two sides from his seat at the main level. Both the aedicule and the parent building are composed of Indiana limestone with terra cotta mouldings and details. A statue of Lincoln, surrounded by a grand exedra by McKim, Mead & White makes a short appearance, but the entire video is incredible.